Audio House RCA 3066. Just for Fun. 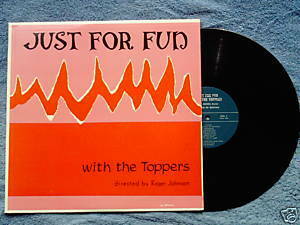 The Toppers directed by Roger Johnson. 1962 LP includes Louise, In the Still of the Night, Moonglow, Unforgettable, Black Rode the Wind, Weep O Willow (with Carol Baggott, soprano). Choral organization directed by Roger Johnson for the Presbyterian College of Emporia, now Emporia State College. Performers include Carol Baggot, Betty Fox, and Barry Roberts on vocals; Sharon Wheat Davis on piano, Graham Kelley on bass, and Jack Mouse on drums. Vinyl is VG/VG; cover with photos is VG with very minor ring wear.